Full back Stephen O’Donnell insisted that Luton can still achieve automatic promotion this season despite heading into 2016 some 15 points off the top three. The Hatters will begin the new year way down in 14th place, as they are 500/1 with bookies Sky Bet to win the title, and unsurprisingly 18/1 to go up, as a play-off spot is by no means a certainty either, with Luton trailing seventh by seven points. However, O’Donnell, who is in his first season at Kenilworth Road, believes the squad is more than capable of mounting a push with 22 games to go as he said: “To be honest, I can’t speak for everyone, but I’m still aiming for automatic. “I think we have the squad and the players, even if there’s injuries. We had five changes and managed to draw away to Pompey, it’s a hard place to come, and we dug in and showed the character that we have. “But we need to show that on a regular basis because hopefully the quality on the ball will come through as that was a defensive display from all 11 players on the pitch. O’Donnell was one of a host of new signings in the summer and although admitting it has been with so many additions, the quality is definitely there for a concerted push in the second half of the campaign. He continued: “I didn’t know a lot of the players when I came down, but from what I see in training, what I see in the CVs, we have more than have enough quality. “It’s hard to make 10 players adapt, there are going to be ups and downs and the gaffer who signed me left a couple of weeks ago. “The new manager whoever it’s going to be is going to have to get us to gel. 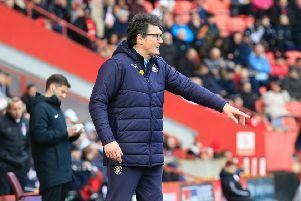 “Andy’s (Awford) done a great job and with the squad that travelled (to Portsmouth), there were three or four good good players left out of the squad altogether. The defender has had a difficult time of it lately though, as injury and a loss of form under previous boss John Still saw him spend three months on the sidelines. However, he was chosen by caretaker Andy Awford for the 0-0 draw against Portsmouth on Monday and is hopeful of remaining in the side. He added: “You can’t dwell on it too much. It was hard to take, I moved down from my family, getting injured and not doing well enough which allowed me to get the (hernia) operation, isn’t something I pictured when I arrived in the summer. “The gaffer has lots of players and if you played everyone that wanted to play then there was going be someone unhappy. “Thankfully I got my chance as Andy had left me out the last couple of games. All you can do is keep working hard, trying to apply yourself in training, you can be grumpy whenever you’re not playing especially when there’s defeats, players are going to want to play and there’s obviously something not quite clicking.